Building community, connecting dots — that's the mission statement behind the Root Down, a rehearsal and pre-production space on Toronto's West side. Co-founded by Oliver Johnson two years ago as a halfway point between jam space and recording studio, it's his hope that that sense of community, those connected dots, will give local music professionals the leg-up to survive in the ever-tumultuous industry, making the space a model that other cities can copy. Located in a basement under a former industrial strip, the Root Down boasts the recording capabilities, sound proofing and arsenal of gear of a high-end recording studio, but mimics the feel of a homemade practice space. Backing onto a pair of elevated train tracks, it was formerly home to illegal DIY venue S.H.I.B.G.B.S., which was shut down in 2015. "They set the vibe," says Johnson of the former tenants. Turning empty spaces into thriving artistic hubs was a hallmark of music labels for decades. "Artists knew that they could come and focus on their craft," says Johnson, citing Motown and Stax as prime examples. "It was all part of their A&R development strategy." But financial woes over the last two decades caused most labels, big and small, to abandon their studios, and with them, artist development. Johnson, who cut his teeth working with artists like Ivana Santilli and Esthero, hatched the concept with tech entrepreneur Dan DeBow half-a-dozen years ago. The idea percolated during the irregular jam sessions the pair would hold. 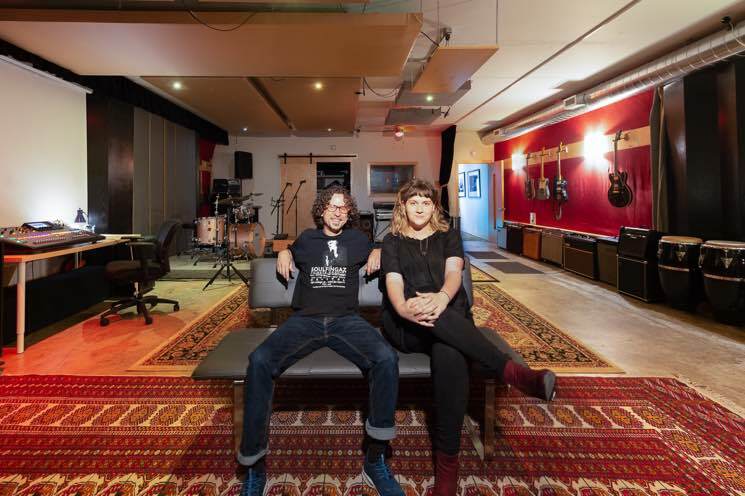 "I didn't know too much about him," says Johnson, who today runs Bedtracks, which specializes in film and television music production, as well as Soleil Sound and the Hive recording studios in Toronto's Corktown. "But as we became better and better friends, we started talking about a place like this." Named for the Jimmy Smith song "Root Down and Get It," which the Beastie Boys famously sampled, they envisioned a place for artists to develop their sound, demo ideas and rehearse without the noise bleed of a jam space or financial pressures of a studio. "It's always admirable when artists, through the adversity of not having the tools, can rise above. But if they do have the tools and they're given the opportunity, they can shoot even higher." Borrowing an idea popular in the tech industry, its community focus would allow for encounters, both spontaneous and deliberate, between artists and industry folk from across the local scene. The expected results: everything from personal artistic breakthroughs to new business partnerships. They pitched the idea to Arts & Crafts Records, who immediately saw the potential, as did folks at Slaight Music, both of whom provided seed capital. They've since developed a partnership with Roland, and several guitar and effects pedal companies have also lent or donated gear. But the Root Down remains an independent entity that works on a referral basis, and whose clientele spans the breadth of Toronto's music community. Broken Social Scene were rehearsing for a string of gigs the week before Johnson and I meet, and the Root Down website lists as clients everyone from Charlotte Day Wilson and Jazz Cartier to the Toronto Women in Music group and Cirque Du Soleil. A handful of annual "premium memberships" guarantee a base level of revenue, and some of the unique gear that lines the walls belongs to those members. But confidentiality issues prevent Johnson from giving the full breadth of clientele. With just a single room, it operates at or near capacity most days. Manager Kathryn Kearns, an musician herself, has made an art of accommodating the demanding schedules of their clients. "We don't want to be the kind of place where people can spend a lot of money and lock it out for a full month, because that goes against our mandate," she says. "Everybody seems to respect that, even people who could technically afford that." Kearns, or one of two in-house engineers, ensures that gear is set up to each artist's specifications before they arrive to maximize the creative possibilities. Describing their business model as akin to "one plus one equals five," Johnson admits that the Root Down is a big experiment. Some sort of expansion is on the horizon, though he's not at liberty to spill the beans just yet. "There are a lot of people with a lot of money looking to foster the arts." Some donate to the ballet, but at the Root Down, they're doing more than just selling time — they're fostering art and actively building community. "This is a place for all those parties to come together."